Firstly, I'm going to be spending some time in wormholes. This is one of the few areas of Eve that I still have almost no experience of, and I feel like that's something that I should probably fix. I had a request not long ago from a corp called Hidden Agenda to provide PVP training to their wormhole division(1), and I decided to make them an offer - I'd make myself available as a ~PVP expert~ for a while, and in exchange they'd let me hang out in the wormhole for a month or so and get a taste of wormhole life. I've been in the hole for a couple of days at this point, and there'll be another post soon covering my first impressions. 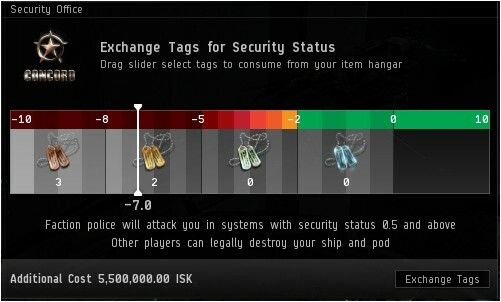 One of the conditions of my stay was that I'd need to fix my sec status, and this is the point where I really have to take my hat off to CCP - Tags 4 Sec is absolutely fantastic. Had I wanted to do this a month ago, the weeks of monotonous grind required to repair my sec status would have just about killed any excitement that I had about the whole project. Instead, I was able to buy my way back to respectability without spending any time playing the game in a way that I didn't enjoy. The overall cost to move my sec status from -9.3 to -1.3 was roughly half a billion, with the bulk of the cost falling over the -5 to -2 range. I feel like this is still painful enough to prevent people from casually 'tag-tanking' to keep their sec status high, but for people like me who're looking for a one time readjustment it's an absolute godsend in terms of maintaining gameplay enjoyment. Absolutely a 10/10 feature. My second new experience is actually a repeat of an old experience, and one that I've been considering for a while - I'm returning to Eve University. 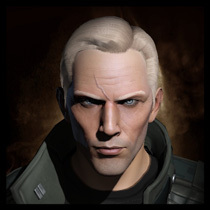 I've always maintained close relations with the corp, offering advice and doing the occasional guest lecture, and have plenty of friends there. It's an institution which has seen huge improvements recently in terms of the level of bureaucracy that they force upon themselves, however one thing that they're often still panned for (slightly unfairly in my opinion) is the way that they teach - or in the words of some commentators, don't teach - PVP. The Uni is such a great place to be as a newbie, so it's always saddened me a little that it wasn't seen as a good environment for learning one of the most exciting parts of the game. That's something I'd like to change, so I'm going to head over there and make myself useful. By 'make myself useful' I really just mean 'haze newbies and complain about the good old days', but after going on five years I guess I'm entitled to that one, right? (1) Let me just apologise to all of you who've been asking about training recently and either haven't heard back from me at all or simply haven't managed to arrange anything yet - I've been getting a huge number of these requests over the last couple of months and simply haven't had the time to stay on top of them all. If you don't hear from me within a reasonable time, just drop me a convo and we'll have a talk.